I’ve seen lots of reproductions of this monotype on paper, The Jet Earring (Profil perdu à la bouche d’oreille) 1876-1877 (The Metropolitan Museum of Art, New York. Anonymous gift, in memory of Francis Henry Taylor), and have loved it. Last week I saw the original monotype for the first time in Degas: A Strange New Beauty at MoMA in New York City. This monotype is a small jewel. Actually it is very small: 3.25 inches x 2.75 inches. I was fascinated to see this monotype had been printed crooked on its sheet of paper which makes me wonder if Degas did not expect the nuances of the monotype to travel well from plate to paper. Perhaps Degas thought the fine lines in the woman’s hair would disappear or the lightness and softness of the feather in the woman’s hat would be lost or the seven or more discernible textures in the lights and darks on the plate would dim or all of the above. I can only imagine Degas’s thrill when he lifted the sheet of paper and saw this monotype for the first time. What a keeper! I wonder if Degas’s second thought might have been, Alors! Remember to double check and make sure the plate is straight on the paper before you print the plate. 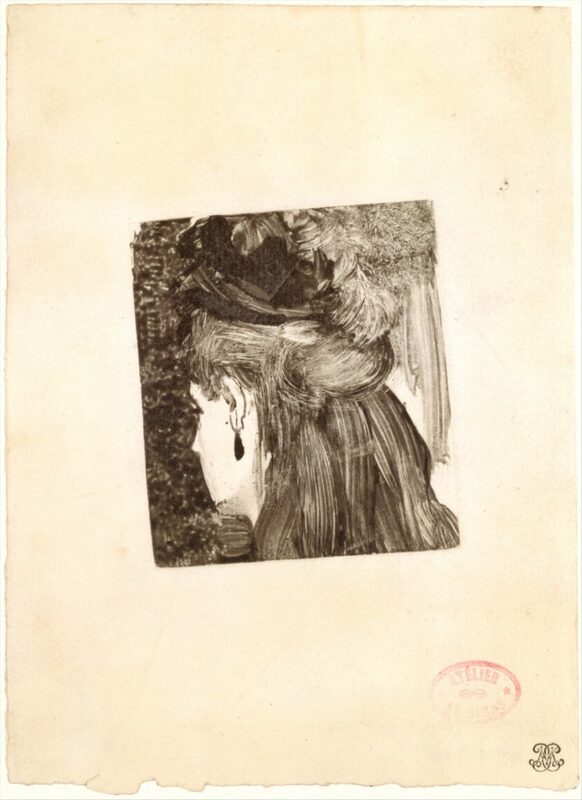 Perhaps the placement of the monotype on the paper is why Degas did not sign this piece. (Oval atelier stamp and chop mark on recto) In reproductions I’ve seen, The Jet Earring monotype image has been straightened. Seeing this perfect little jewel of a monotype imperfectly positioned on its sheet of paper, I truly felt the touch of Degas’s hand. Magnifique!